By Melissa Lennig on November 15, 2015 2 Comments. This content contains affiliate links. As an Amazon Associate I earn from qualifying purchases. I sent the boys into the bathroom to brush their teeth, then settled on the couch with a book. They bounced back into the family room about 30 seconds later. “Did you brush?” I asked suspiciously. “Yup!” They both answered, dropping to the ground to wrestle. I paused for a moment, wondering if 30 seconds was enough to brush away the day’s peanut butter sandwiches, apple cider, chocolate chip cookies, and milk. “Siri, how long should kids brush their teeth for?” I asked my phone. “Hmm. Let me think. OK, I found this on the web for ‘how long should kids brush their teeth for. '” The boys giggled, my husband rolled his eyes, and I researched. Turns out, 30 seconds isn’t nearly enough time. Children should spend 2 minutes brushing—twice a day—while concentrating on the back molars where cavities tend to develop first. I sent my boys right back to the bathroom for a redo. Shared below are 10 tips for making oral health a habit in your home. Numbers 2, 5, and 7 were game changers for us! The American Dental Association and the American Academy of Pediatrics both recommend using a grain-sized amount of fluoride toothpaste as soon as your baby’s first tooth appears. Graduate to a pea-sized amount when your child turns 3 years old. There are dozens to choose from, each with entertaining characters, timers, and music. An app or timer can help your child brush for the recommended 2 minutes, twice a day. School-age children should practice flossing daily to keep their teeth and gums healthy. My boys struggle with traditional dental floss and prefer floss sticks. Be a good role-model because kids will naturally copy what they see. Brushing with your children is an excellent way to reinforce healthy habits. Several times a week, I intentionally stand behind the boys and brush my teeth with them. They watch my reflection in the mirror and copy my every move without prompt! After your child is 6 years old, a fluoride rinse can help prevent cavities. 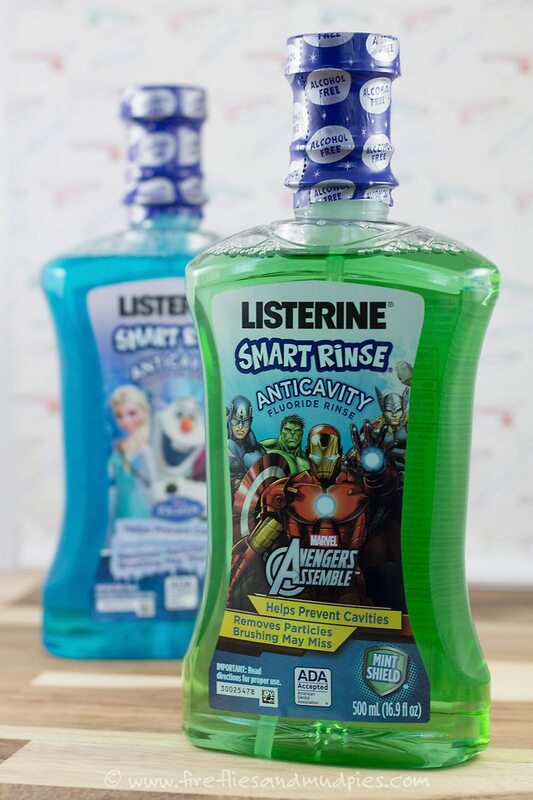 My children like the flavor and ease of Listerine Smart Rinse® Avengers® and use it every morning and night. 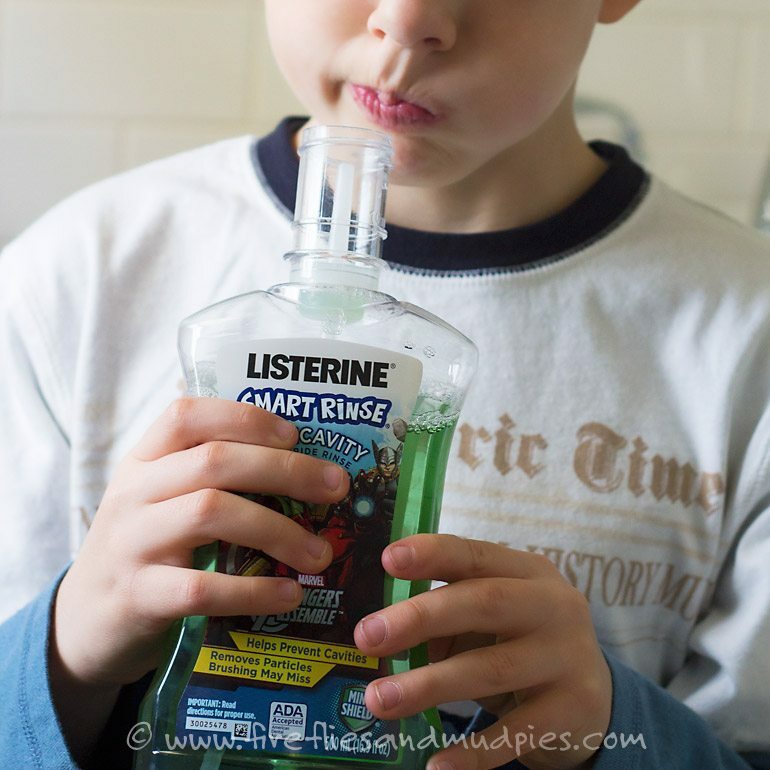 LISTERINE® Kids strengthens teeth 99% better than brushing alone and provides 12 hour cavity protection, making swishing an important part of our bedtime routine. 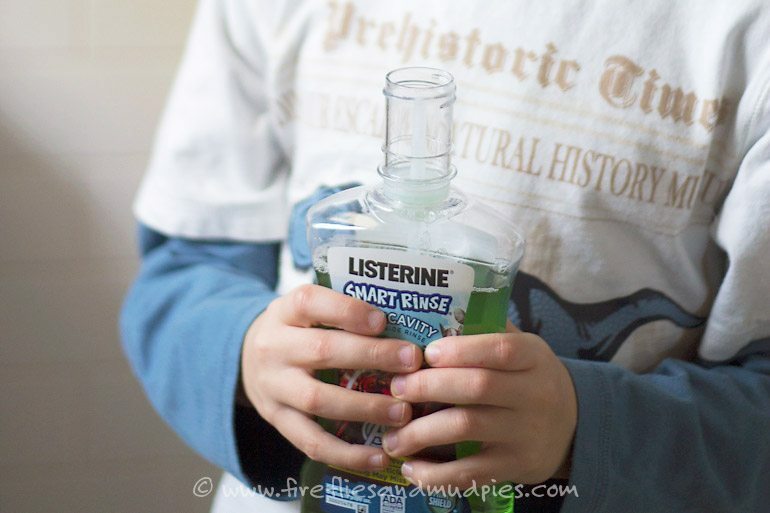 Learn more about Listerine Smart Rinse® HERE. Toothbrushes should be replaced every 3 or 4 months. A soft bristled, child-sized toothbrush is best. Kids want to be healthy—they really do. Showing children a photograph (or two) of tooth decay can help them understand the “why” behind the importance of taking care of their teeth. The purpose of this isn’t to frighten children, but to educate. We’ve discovered some fabulous books about oral health and hygiene for children. My youngest son’s favorite is Brush Your Teeth, Please: A Pop-up Book by Leslie Mcguire. Children should visit with their dentist every 6 months. Tip: A friendly, pediatric dentist is an important partner in reinforcing oral health habits! I let my kids eat sweets—they are kids after all! But they also eat an abundance of nutrient-rich raw vegetables and fruits, and mineral-rich soups (like homemade bone broth). It’s important for kids to understand that apples, dark leafy greens, strawberries, nuts and seeds will help keep their teeth healthy and strong. 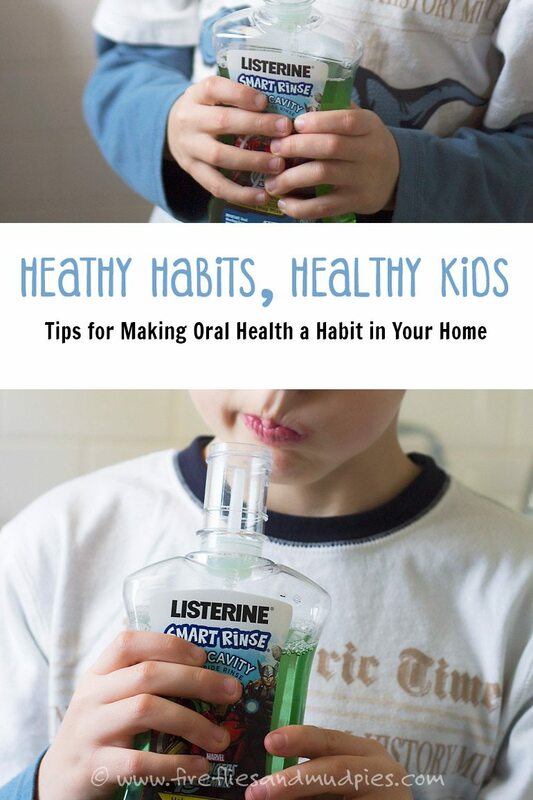 How do you make oral health a habit in your home? Share your tips in the comments! Kids often learn by example, I like #4. Your post is great, with a lot of helpful tips for parents. Thank you for sharing!